This is the SuperSet homepage. SuperSet is a game based on the SET game. SET is a very addictive game in which the user has to select sets of 3 cards out of a display of 12 cards. Read the manual for more information about the game. I developed SuperSet because I would like to have a Pocket PC version of SET on my HP iPAQ HX4700. Furthermore, due to my interest in client-server applications, I wondered if I could write a SET version for two players over the internet (due to lack of motivation I never finished this feature, ahum). Anno 2014 the Pocket PC version is no longer supported, but now also a version for Android is available. The software is under development. However, current available versions for PC and Pocket PC can be played in single player mode. SET was developed by Marsha Jean Falco in 1974 to study genetics. It was made public in 1991. Now it is available as a family game (in the Netherlands it is sold as ‘Set!’). Various implementations exist for the computer. A popular implementation for PC is TatSet by Teun Wardenaar. Anno 2014 it does not appear to be supported anymore. gained by clicking the hint. Clicking the ‘no-set’ button when there is no set adds three new cards and resets the increment to 100 again. The graph below show measurements of the decreasing score increment in time for TatSet and SuperSet 1.1 on my HX4700 iPAQ and the PC. The purple line is a fit (score increment=99*exp(-0.046 t)+1, t in seconds). The PC versions of TatSet and SuperSet perfectly line up. 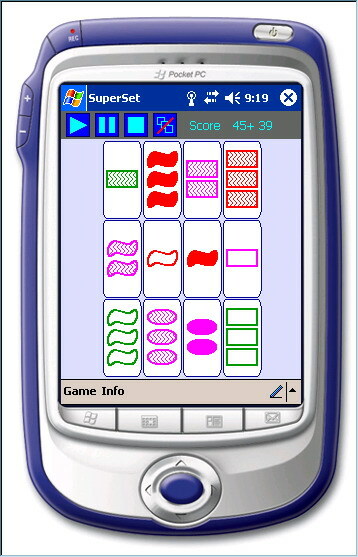 The Pocket PC version is gives slightly higher scores because of the score increment decreases slightly less in time. This is probably due to other timer behaviour on the Pocket PC compared to the PC. This is to be compensated in future versions of SuperSet. The software is heavily under construction. Only the single player mode currently works. Since version 2.0 the SuperSetServer is available. Highscores of single player games are can be sent to the server and for each player the highscore is maintained. Note that versions are not compatible. Download the exe files and place them somewhere. Create a shortcut to the exe file on your desktop or start menu.